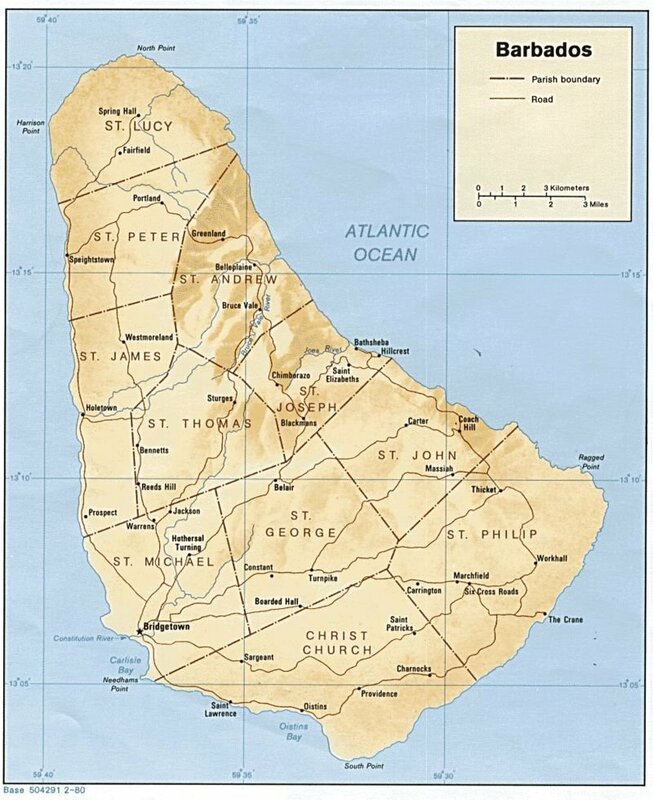 Map of Barbados, waves, trident and cornerstones. The trident symbol was taken from Barbados' colonial badge, where the trident of Poseidon is shown with Britannia holding it. The broken lower part symbolizes a symbolic break from its status as a colony. The three points of the trident represent the three principles of democracy: 1) government of the people, 2) government for the people, and 3) government by the people. Fondly remembered for laying the foundation of social reform in Barbados, Charles Duncan O’Neal dedicated much of his life to working for the poor and to agitating against the deep-seated racism inherent in Barbados during the 1920’s and 1930’s. He was considered to be of a high social and professional "status" within the island’s society, as he was a medical doctor of the "privileged" class. Duncan O’Neal’s stance on social reform was the first time in the island’s history that a university-educated professional had aligned themselves with what was considered to be the "lower" classes of society. Charles O’Neal was also the first black activist of the time to campaign for free education and dental care for children, improved housing, and the abolition of the Located Labourers’ System and the Masters and Servants Act. Born in Barbados in 1879, Charles O’Neal left the island after secondary school to study medicine at Edinburgh University in Scotland; it was there that his interest in, and passion for, politics grew. During this time, he ran for a local government office and in fact won a seat, however he felt compelled to go back to Barbados and spread his socialist message around the island to his fellow Bajans. In 1910, he did return to Barbados but found the conditions so depressing that he went to live and work in Trinidad and Dominica. However, after 14 years, he was once again drawn back to his beloved island and it was in October 1924 that O’Neal founded the ‘radical’ Democratic League political group, based on his socialist ideals. In 1932, O’Neal won a seat in the Barbados House of Assembly as a Member for Bridgetown. During his time in Parliament, he continued to fight for workers’ rights, the poor and disenfranchised, and persistently campaigned for abolishing the practice of child labour. 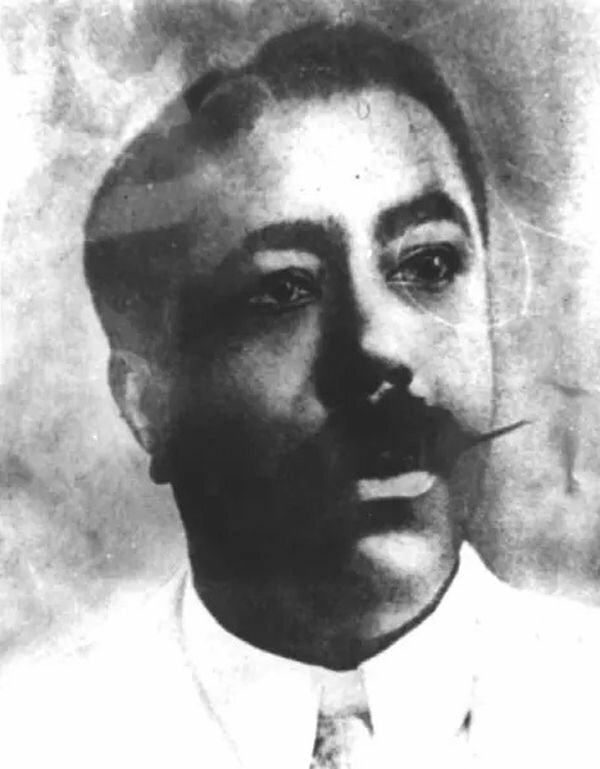 Charles Duncan O’Neal’s many achievements include the creation of a wide network of grass-root organizations – he founded the Democratic League; in 1926, set up the Working Men’s Association; launched a co-operative venture in Bridgetown; and he also invested in a newspaper called ‘The Herald‘, which promoted a message of social change. Charles O’Neal is also credited with being the first politician in Barbados to campaign for the improved conditions for women in the workplace, and supported the role women held in leadership positions in the Democratic League as well as the Working Men’s Association. It’s also worth noting that one of the two main bridges over the Careenage in the nation’s capital-city (Bridgetown) is named after this local legend – namely, the Charles Duncan O’Neal Bridge. In 1998, by an act of Parliament, Charles Duncan O’Neal was also publicly honoured by his mother country by being named as one of the ten official National Heroes of Barbados, which celebrates those Barbadians who have made outstanding contributions to the country’s history and development. Left of center is the coat of arms. 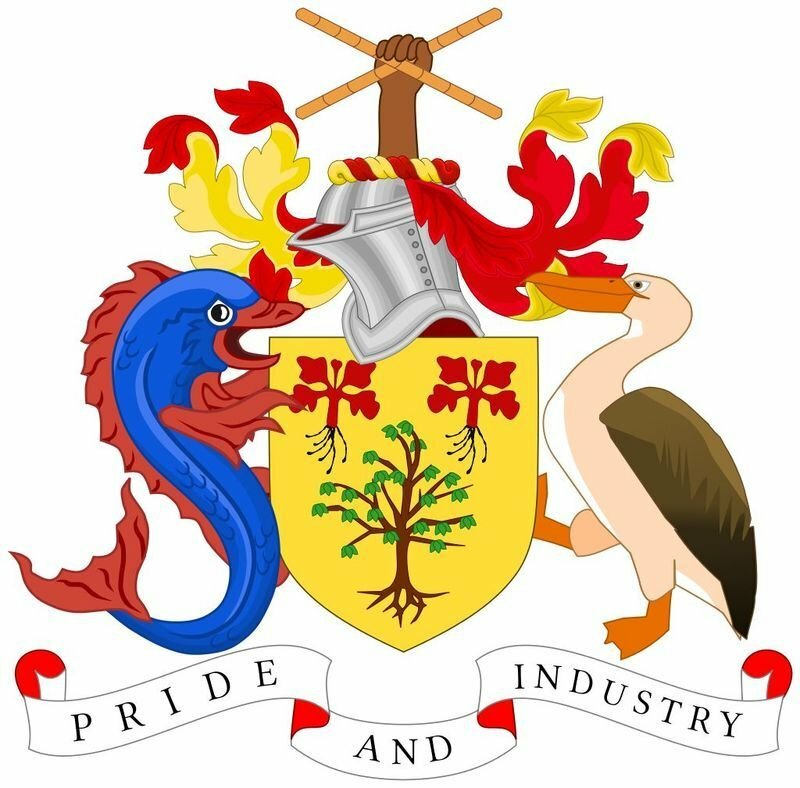 The coat of arms of Barbados was adopted on 14 February 1966 by royal warrant of Queen Elizabeth II. The coat of arms of Barbados was presented by the Queen to the President of the Senate, Sir Grey Massiah. Like other former British possessions in the Caribbean, the coat of arms has a helmet with a national symbol on top, and a shield beneath that is supported by two animals. The arms were designed by Neville Connell, for many years curator of the Barbados Museum, with artistic assistance by Hilda Ince. The national symbol found on top of the helmet for Barbados is the fist of a Barbadian holding two stalks of sugar cane, that are crossed to resemble St. Andrew's Cross. This is representative of the importance of the sugar industry as well as Barbados celebrating its national independence day on St. Andrew's Day. The shield is gold in colour. Upon it are a pair of the national flower, known as the Pride of Barbados, and a single bearded fig tree (Ficus citrifolia). The shield is supported by a dolphin fish and a pelican. They stand for the fishing industry and Pelican Island, respectively. At the bottom is Barbados' national motto ("Pride and Industry") on a scroll. Centered is the Sailfin Flyingfish (Parexocoetus brachypterus). 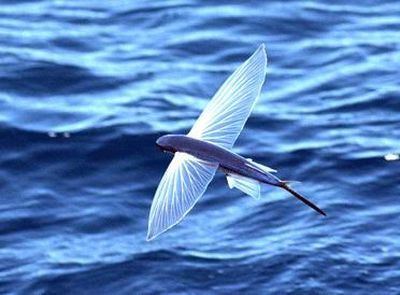 The sailfin flyingfish (Parexocoetus brachypterus) is a member of the flying fish family. Like other members its family, P. brachypterus is known for its ability to leap out of the water and glide above its surface. They have a distribution range that encompasses the Atlantic, Indian, and Pacific Oceans. It is an epipelagic fish and can be found in in coastal waters but are rarely encountered in open oceans. They are known to spawn during the months of September to April in the waters near Barbados and Puerto Rico. Appearance wise, the sailfin flyingfish is known to have a robust build, blunt snout, short pectoral fins and having a long dorsal fin. Stylized dolphin fish, from coat of arms, as a see-through feature. Denominations in numerals are in all corners, in words centered. On banknote - Trafalgar Square (National Heroes Square) in Bridgetown; Parliament buildings, The Fountain Dolphin, Cenotaph and the Careenage, Eastern Carlisle Bay, Bridgetown. 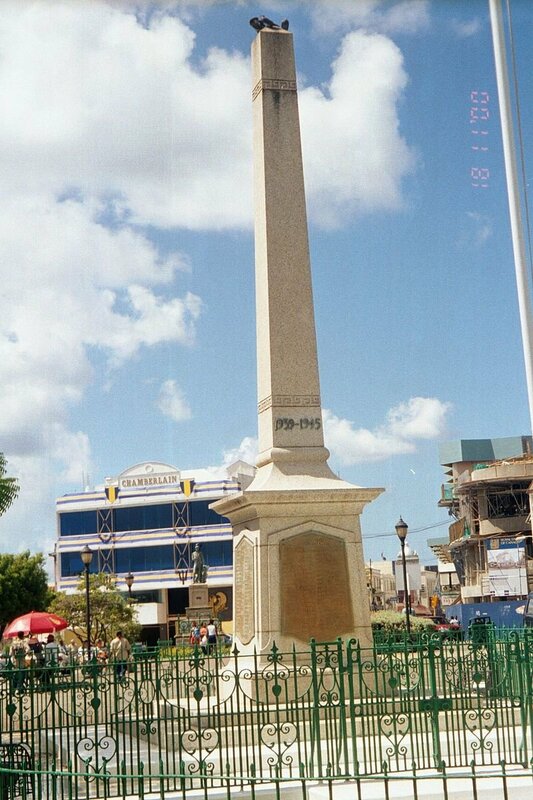 National Heroes Square, formerly Trafalgar Square, is located in Bridgetown, the capital and principal commercial center of the island-nation of Barbados. 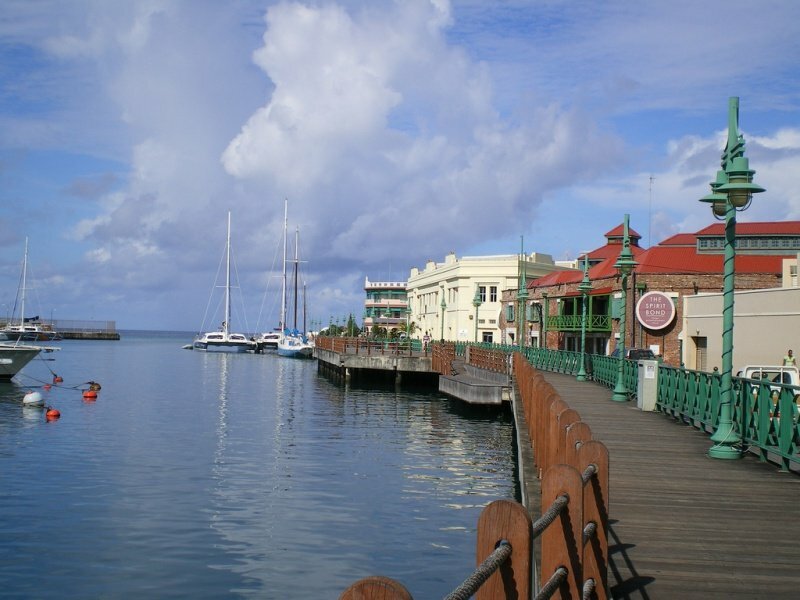 The square lies along Upper Broad Street and is on the northern shore of the Careenage ("Constitution River"), found directly in the center of Bridgetown. The current name of the square was not so long ago - in 1999. Before that, it was Trafalgar Square - an echo of English colonization. Yes, and the square itself is an exact copy of London. On the square of heroes also stands a column with a monument to Admiral Nelson. By the way, Nelson in Barbados appeared earlier than in London. This happened in 1813, and the English twin was only put in thirty years. The Heroes' Square is also a kind of zero kilometer. In Bridgetown it is customary to measure the distance from this area, or rather from its column. The Government House (the 18th century), the Central Bank, the Parliament decorated with a small Big Ben, and the oldest building of the city - the attorney's office of Harford-Chambers, adjoin the square. The office building attracts attention with uneven masonry and Gothic pediments. The main decoration of the Square is the Anglican Church of St. Michael (1789). More than once the cathedral was destroyed by hurricanes, but it was always restored, as it was George Washington himself who prayed in his walls when he lived in the current house museum of Washington. 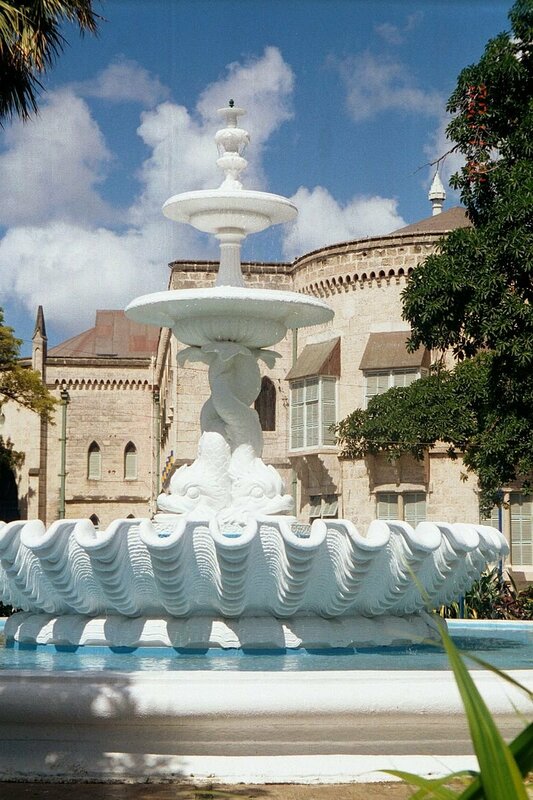 The Parliament Buildings (also known as The Public Buildings, or more rarely Parliament House), is the seat of the Parliament of Barbados. 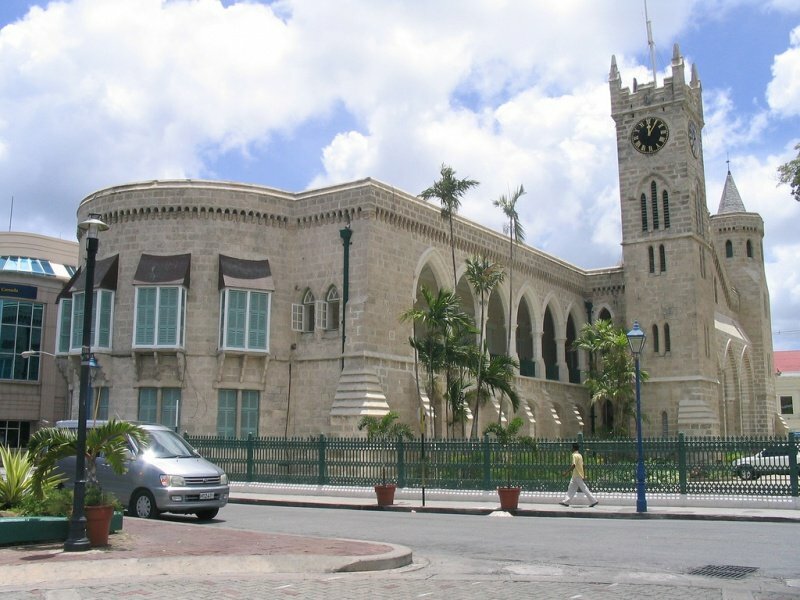 Built between 1870 and 1874, the buildings have been the meeting place for both chambers of Parliament since 16 June 1874, and a former site of Colonial administration of Barbados. It consists of two buildings in the neo-Gothic architectural style, and are reminiscent of the Victorian era of Great Britain. The buildings are situated along the north bank of the Constitution River and are bordered by Upper Broad Street and National Heroes Square to the south; strategically at the heart of the capital city Bridgetown. Prior to the establishment of the buildings the legislature met at the Town Hall building on Coleridge Street. In 1989 the Public Buildings were officially renamed the Parliament Buildings by Act of Parliament. In 2011 both buildings were designated as UNESCO protected properties within the World Heritage Site of Historic Bridgetown and its Garrison area. Careenage is the deep harbor of Bridgetown at the mouth of the Constitution River. Not far from Trafalgar Square are two bridges, from where you can see a magnificent view of the bay of Careenage, and you can see how the elongated water ribbon literally breaks into the center of the city. Harbor Careenage serves as a parking lot for cruise liners, luxury yachts. Cenotaph or War Memorial is visible on right side. The names of those Barbadians who lost their lives in World War II (1935 - 1945) were added in 1953 on a fourth panel. In Barbados, a Remembrance Day Parade is held at the War Memorial which is located at National Heroes Square in Bridgetown. Churches from all over Barbados take part in this special early morning parade. The Royal Barbados Police Force Band would normally play for both the parade and also for the march that takes place from Central Police Station to National Heroes’ Square. Members of a number of armed and unarmed uniformed groups including The Close-up of the Names Inscribed on the War Memorial, Located in Bridgetown, Barbados Red Cross Society, The Barbados Regiment, The Barbados Legion, The Royal Barbados Police Force, The Barbados Cadet Corps, The Barbados Prison Service, Barbados Boy Scouts, The Girl Guide Association of Barbados, The Barbados Fire Service, The St. John Ambulance Brigade and The Barbados Coast Guard take part in this parade. Wreaths are laid at the War Memorial by the Governor General, the Prime Minister of Barbados, the Opposition Leader, members of the diplomatic corps and other dignitaries at the end of the Two Minute Silence and the Sounding of the Last Post. Family members of those who died in both World Wars are also to get involved in this wreath laying ceremony. 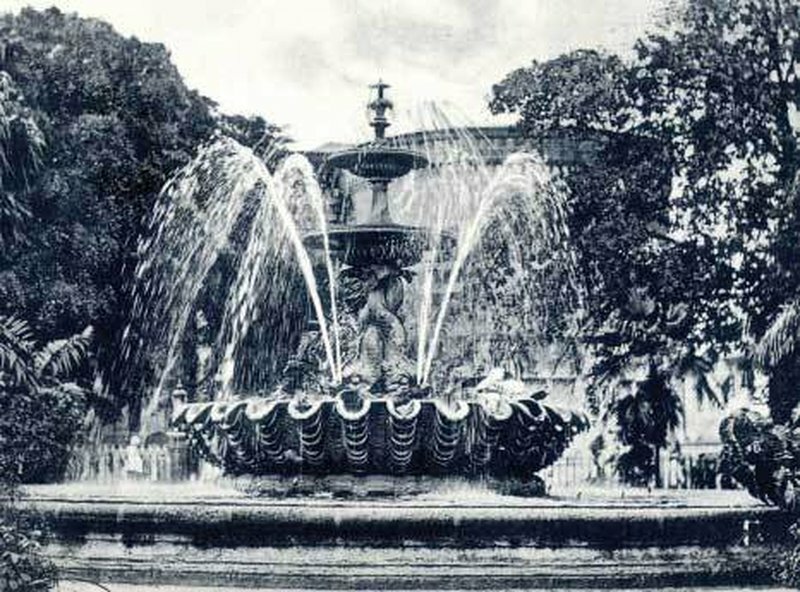 On right side is the fountain "Dolphin". Ben’s Spring is one of the fresh water springs that flow from the base of the upper coral rock terrace that make up the center of the island. These coral rocks were the first to rise above the sea 1 to 2 million years ago. In 1860 the Barbados Government decided that it was time that piped drinking water was provided for the inhabitants of Bridgetown. Up to that time there was no piped water. Each property had its own well. In addition there were a few springs in the area, notably in the areas of the Queen Elizabeth Hospital and Spring Garden. This was a very unsanitary situation as each house also had a toilet well, usually close to the water well. To get the water into Bridgetown a 12-inch cast iron pipe was laid from Ben’s Spring, in New Castle, St. John, to Bridgetown. The engineers laid the pipe so that the water flowed by gravity from the source to Bridgetown. This was an amazing engineering achievement, as it had to take a route that would not rise above the source height. Ben’s Spring is approximately 100 Meters above sea level and the distance to town would be about 25 Km. From New Castle it went down to Bath Plantation, passing close Bath Sugar Factory, up to Codrington College, Palmers, Between Oughterson and Busy Park, St. Philips Church, through the St. George valley, running parallel to the Train Line, and into the city. Sections of this pipe are still in use although it is a constant source of leaks. It is over 140 years old, and the route in St. John is known for landslides. Between Codrington College and Consett Bay it descends into a valley before climbing up to Palmers and Thicket. The pressure that the old pipe had to withstand was demonstrated a few years ago when a fitting failed and the water was spouting about 30 meters straight up. The Barbados Water Authority is in the process of replacing it with a PVC pipe. Denominations in numerals are in three corners, in words - in lower left corner.